At this coffee shop I’m inhabiting, I overhear two women in the corner, chatting with each other, me picking up only the words, “dancing,” “dancing,” as they watch some sort of video on an Apple laptop that I can only assume features someone, possibly them, dancing. They aren’t talking obnoxiously loud or playing their video at a high volume. No, they are not weirdos. I am. I am clearly eavesdropping like the creepity-creepster that I apparently am. But I creeped (crept?) for a reason, and that is because I was just starting to write this blog that is purely about dancing. It might seem odd to write an entire post about dancing and how the act of dancing is awesomesauce, but I really don’t care because this is a blog, and blogs are like Jerry Bruckheimer movies in that anything goes, especially nonsensical anythings, montages rife with explosions, and close-up shots of Megan Fox’s cleavage. That, and because of the last two weekends. When you dance, you bond. Everything that you hold back inside comes out. Any insecurity plaguing your mind vanishes. You give up any hint of shyness or timidity to your partner or to your group. People who don’t dance are either hiding something or are missing out on the opportunity to express themselves in a complete way. This is why I have a problem with one lyric in Blink 182s “First Date,” a pop song that I otherwise love and listen to ALL THE TIME. Tom DeLonge poses this question. A lot of musical purists should, rightfully, attack me for reading so much into so shallow a song. * But I can’t help it. 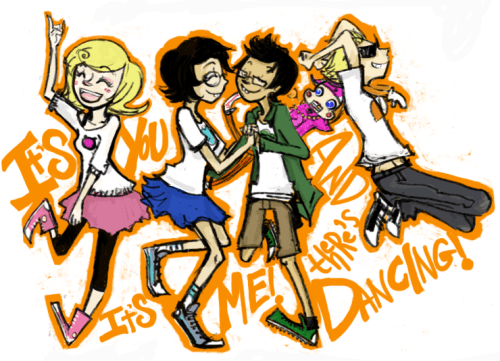 A first date with someone who thinks “it’s lame to dance” would be a disaster, an awkward forgettable evening. Even Nietzsche, who would have been a terrible date** for any non-Nihilist woman or any woman who did not want to contract syphilis, said he would only believe in a God that knows how to dance. *Not that I haven’t done this before. **I think Bruckheimer just got a pitch for his first rom-com! Dancing, to me, makes memories more vivid. It acts as a catalyst for remembering some of my favorite people and events. It’s partially programmed because of the way dance has inserted itself into American traditions, like a wedding I attended two weeks ago in which two of the most wonderful people in the world, who I have known for many years, were getting married. At the reception, the bride and the groom shared a first dance, which was followed by a dance between the bride and her father. Everyone else joined after this point. It always happens this way. The wedding celebration is not complete without family, friends. And dancing. Dancing can lift an ordinary night or an ordinary place into a new realm. Let’s go with place first. I went to Knox Street Pub last weekend. It is a bar in Dallas that exists almost entirely as a dance floor. Every city and college town has at least one or two of these places. They are not clubs. They don’t attempt to convey a classy atmosphere. There is no dress code; as long as you’re not wearing a wife-beater, you’re good. There is just a dance floor. On that floor, which is probably covered in more grime than the entire city limits of Branson, ridiculously drunk people make out and grind with each other. Real creepsters (the non-coffee shop variety, SO NOT ME!) lean against the wall and stare at the scene around them, waiting to make a move that no one wants made on them. Big groups dance and dance and dance, and they form circles, in which complete strangers are invited to express themselves in whatever way they feel, usually gaining acceptance and applause from the formers of the circle. Even more ridiculously drunk people make out and grind with each other and then puke on the patio outside as they get thrown out by a bouncer who might or might not be wearing an egregious silver chain. Loud pop music plays. Nothing about that last paragraph reads entirely normal. Yet at Knox Street Pub, those activities make it a destination bar. You don’t want to go there every weekend, but when you do, you’re going to have a great time. The night before you attend a wedding, especially one for which you travel back home, is supposed to be average because the point of your entire trip is the event that takes place the next day. So three of my Kansas City friends and I went to a bar for maybe two hours that night before. Maybe. I drove, so I drank almost nothing, and we were back at my friends’ house by 1 a.m. There were about seven or eight of us now, a group of guys and girls, and it just felt right to turn on Bruno Mars’ “It Will Rain,” sing to it and dance like idiots and then to do the same to “All of the Lights,” “Call Your Girlfriend,” “Super Bass,” “We Found Love,” and so on. I kept checking the time. One turned to 1:30, which rolled to two and then finally three. And we were still dancing. Finally, I decided to leave. My friend Mike then played Toto’s “Africa*,” at which point I decided to stay for just a while longer. I won’t necessarily remember that night down the road, but maybe I will, partially because, as most of my friends know, I remember EVERYTHING and the date on which EVERYTHING occurred. *The wife-beater lobbyists are going to kill me if they read this blog. And I hear they’re a rather violent bunch. My friends and I were dancing up a storm, making circles, probably doing that fish on a hook dance that everyone did back in high school. And at one point in the circle, everyone did this dance where they moved their arms in a circular fashion. I couldn’t do it. The simplest dance move ever, and I couldn’t figure it out, instead moving my wrists and forearms, looking like a poor imitation of Arsenio’s audience members. No one could stop laughing, and we did this new move all the time. It was great, one of my favorite memories of all my high school friends together. And it wasn’t a lame move. Because I was dancing. Last Friday night, I think, while we danced until three in the morning, aware we would have to wake up in just a few hours for the next day’s wedding, I shared a thought with my friend Tommy. Tommy kind of agreed, kind of said that there are all kinds of people who do stuff that would seem crazy to someone else. Even we probably practice habits or customs that others would look on with a measure of curiosity or a sense that they just don’t understand. But it certainly isn’t dancing to Toto at three in the morning. Can’t be. No one should ever consider that strange.